The presence of bites can also be an indication that bed bugs may be present. However, not everyone reacts and bite reactions vary between people. If you wake up with red itchy spots on your hands, shoulders, legs, or neck, there might be a Bed Bug infestation in your home. Unlike Bed Bugs, fleas tend to bite around the ankles, and this is an important difference if you have any doubts about the bites. See the image below for a typical the signs of a typical bed bug bite. Blood spots on the sheets as seen in the image below may be an indication that bed bugs are present, and an inspection should be undertaken. The spotting can be the result of the bugs releasing excess serum during feeding, but may also be due to the insect defecating digested blood (and will appear darker). Bed bugs are quite delicate when fully blood engorged and if the sleeping victim turns over, bugs can be squashed leaving a blood mark. Spotting is the faecal traces (i.e. the ‘poo’) of bed bugs. It is most evident as a series of small black dots, 0.5-lmm in diameter, and consists of digested blood. Usually the spotting is grouped as the insects are ‘gregarious’, meaning that they tend to sit together in their harbourages (resting locations). Contrary to popular opinion, bed bug spotting is not always black as seen above. It can be off-white to cream, through various shades of grey to almost black. However, the black spotting is the most obvious. Next, we see much heavier spotting indicating a moderate infestation. This was only picked up by turning the slat upside down. Following that we see very heavy spotting below with several bed bugs and eggs indicating a major infestation. Finally, we see an extreme infestation below. So much faeces have been deposited that the bed appears to be almost painted black. There are huge numbers of bed bugs of various stages, eggs and cast skins. We would hope that the infestation would never get to this stage before being picked up and treated. Have you woken up to find bites or even something that looks just like a bed bug or its eggs? Don’t panic, it may not be a bed bug. Many Auckland’ers find similar looking bugs or insects and assume they have an infestation. Cockroach nymphs, squashed beetles, various insects, and even plant seeds, have all been mistaken as bed bugs! If in doubt, have your ‘bed bug’ checked by your local pest controller or an Entomologist (someone who studies insects). If are worried that you have bed bugs and want to check for yourself the first thing to do is to conduct a thorough inspection of all potential hiding areas. Below we will discuss the most common locations we find bed bug infestations. As the name ‘bed bug’ implies, the insect is most commonly found on beds (where a readily available blood source usually awaits). Bed bugs tend to be found on the mattresses and the ensemble base (box spring), but especially in darker areas close to the wall. The insect tends to harbour (hide) along seams, piping, under labels, comer protectors, under the base fabric of the ensemble base and in the base itself. They are less likely to be found on open flat areas. 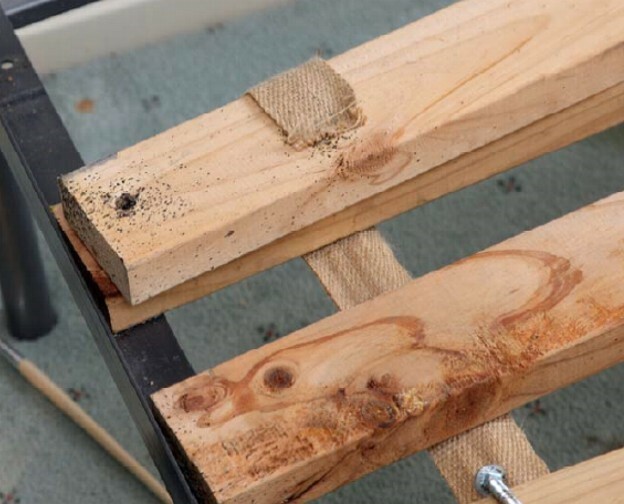 Bed bugs will readily harbour in bed frames, especially if constructed of wood, where they will hide in cracks, joins and knots. While metal framed beds provide fewer locations for bed bugs to hide in, they are not immune from the insect as seen below. Bed ornaments such as cushions, pillows, and soft toys, can also become infested. Any wooden material provides numerous cracks and crevices for bed bugs to hide in. Being part of the sleeping area means that wooden slats are especially notorious for harbouring bed bugs. The number of bed bugs are usually not obvious from above and only becomes evident once the slats are removed from the frame. In a room with bed bugs, any item of furniture can become infested, although those closer to the bed tend to contain more insects. In complexes with shared facilities, chairs and lounges in common areas can be invaded by bed bugs and act as a source by which the insect is spread to other rooms. In lounges, bed bugs can be found in a variety of locations, underneath the arms, along cushion seams (as shown below), behind buttons, etc. In a typical bed bug infestation, various cracks and crevices in walls can provide a home to bed bugs. They tend to favour areas low down such as along skirtings and wall joints. Certain types of constructions tend to make control much more difficult, such as open brickwork, unpainted walls and false decorative walls. Curtains, especially if near to the bed, can hold bed bugs in the pleats. Various electrical fittings, such as power points, light switches and telephone sockets, can act as a harbourage for bed bugs. As these tend to penetrate the walls, electrical outlets can be a means by which the insect can spread to other rooms. Even in minor infestations, bed bugs tend to rest along carpet edges and underneath straight edges (also known as ‘tack-down’ strips). It is usual that the carpet has to be lifted for treatment. Literally, any (and every) item can become invaded by bed bugs in an infestation and these images represent just a small sample. Below we see a pair of sneakers with cast skins and eggs. Many people store bags underneath the beds, which is ill-advised as bed bugs picked up while travelling can quickly transfer to the bed to start a new infestation. Below is an image of infested luggage, with bed bug spotting and cast skins. This could be evidence of how the infestation was brought into the home, or an infestation waiting to be carried elsewhere? Unfortunately, bed bugs are not confined just to the areas where people sleep. As mentioned above lounges and chairs in common areas can become infested, along with just about anywhere people sit, lie or travel. This includes; campervans, caravans, hospitals, doctors’ waiting rooms, cinemas, offices, shops, public transport (trains, planes, buses, trams), even massage tables! Now many people are calling bed bugs, the ‘exposure pest’ as you can be exposed to the insect wherever you may be. Contact your local pest controller immediately. Keep the insects and show the pest controller as they may not be bed bugs. Inspect beds for bed bugs when travelling and arriving at your destination. Do not throw out infested belongings, they are usually treatable. As with most things in life the best defense is a solid understanding of the issue. By having read this article you protecting yourself from a serious beg bug infestation. If you have already ordered a treatment or are wanting to find out more have a look at our Bed Bug Treatment Guide.